One of the most fantastic things about living in the Midwest is fall. From the vibrant leaves in reds, oranges, and yellows, to campfires and hoodies, autumn is beautiful. I can hardly wait for summer to slowly fade into a cooler fall. To me, it’s the best season, filled with family, friends, and the lingering scent of pumpkins and cinnamon as the outside world transforms into a brilliant array of colors. When I want to experience the weather and beautiful sights to the fullest, I take the Great River Road towards Pere Marquette State Park. This scenic drive alongside the Mississippi River is famous for its gorgeous views and changing leaves. Once in the park, a quick stop by the Visitor’s Center to plan our fall foliage adventure is definitely in order. 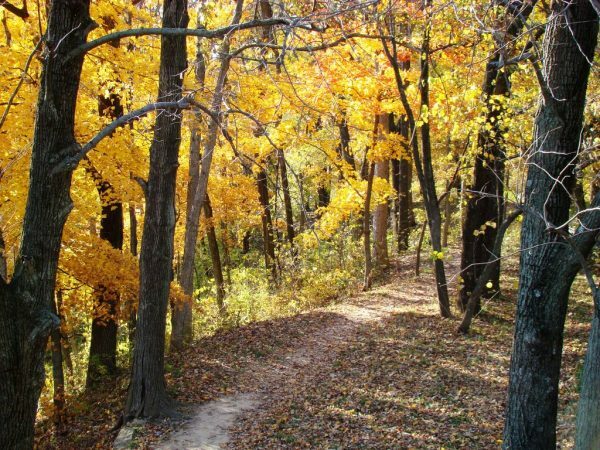 There are hiking and biking trails throughout the 8,000 park along with a winding scenic drive. The Eagle Roost outlook alone boasts some of the most breathtaking views of the river and changing leaves. Nestled in the heart of Pere Marquette State Park is the perfect fall getaway, especially for nature lovers like me. Pere Marquette Lodge offers the best of two gorgeous views with the shimmering Illinois River on one side and the vibrant fall foliage on the other. Whether snuggling up close to the massive stone fireplace, enjoying a glass of wine on the terrace or just strolling through the brilliant colors, Pere Marquette Lodge in the fall is one of my favorite places to be. As autumn approaches and we begin to dig out the other half of our wardrobes, it’s important to remember to slow down and enjoy the season. I love the crisp, cool air of fall mornings at the park and my guess is that maybe you will too.